5BR 6BA 2 complete kitchens. 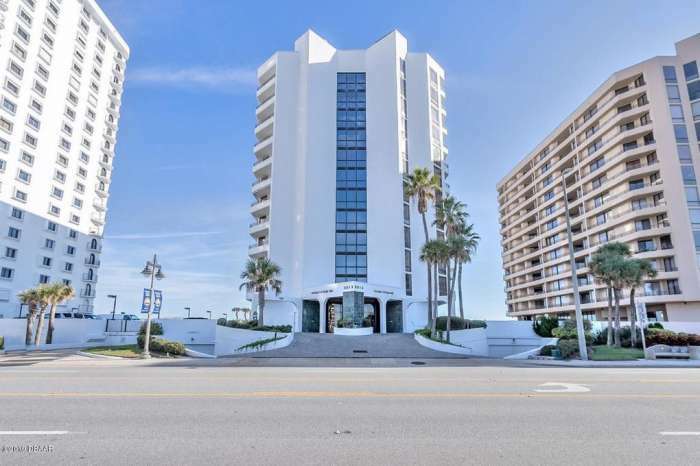 Rare opportunity to own a one of a kind oceanfront condo in the sky. Over 5100 SFLA. Perfect for extended family or corporate retreat. 2BR 2BA condo. Less than 1 mile to I-95, grocery & shopping areas & less than 5 miles to the World's Most Famous Beach. 3BR 3BA home w/upgrades galore including quartz & granite counters, extra spacious master bedroom & oversized 2CG. 26 RESIDENTIAL POOL ACCOUNTS, NSB. Port Orange area. Ready to go business. Call for more info. 3BR 3BA home w/over 2700SF of living area, open floor plan. Loft can be extra BR or game/media room. Light colored cabinets & flooring. Many extras & upgrades throughout. Fully fenced yard on cul de sac. 2BR 2BA townhome will make a great place to live, rental property or winter retreat. Convenient location less than 1 mile from I-95, close to shopping, restaurants & colleges. 2BR 2BA home in coveted Margaritaville 55+ community. Upgraded pool home w/tile in living areas. Bonus room could be den/office/BR. Centrally located 3BR 2BA home overlooking lake. Living room & family room, inside laundry, roomy 2CG. Great location. 5BR 4.5BA home offers breathtaking sunsets, ocean breezes & exquisite appointments. Carefully configured kitchen, decorative arches & more. Beautiful 5BR 4BA estate home. Lovingly maintained & upgraded. Huge dual master suites, private guest quarters. Ocean views from rooftop deck.